Munich Oktoberfest Camping & Dorms i München, Tyskland: Reservér nu! We are based at the famous Camping Thalkirchen in Munich and offer camping and dorm packages for Oktoberfest. We offer tent and dorm accommodation. The dorms offer everything the same as camping but with a bed and a roof over your head. Dorm beds are in either 4 person or 10 person rooms. The campground offers great facilities with a number of shower/toilet blocks, small supermarket, hot food outlet and bar. 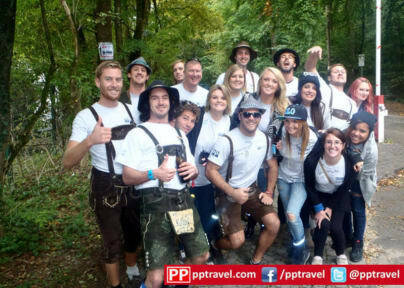 You will be greeted by PP Travel crew upon arrival who will be happy to provide full information on the Oktoberfest. We supply cooked breakfasts daily, transport to the Oktoberfest upon request, valuables storage facilities, mobile/laptop/camera/etc charging service. The tents are provided and per-erected awaiting your arrival. You do need to bring bedding with you. In the dorms there is a mattress but you do need to bring sleeping bag or similar bedding with you. The dorm rooms have a limited number of lockers available. The lockers will require a padlock and are big enough for day pack size bags. Check in from 07:00 to 22:00 . Luggage storage at own risk. Credit cards and non UK debit cards attract a 2.5% surcharge.